CPR's Aquafuge. Some Chaetomorpha culture and skimmer bubbles now!~ And some newer, larger units and the company owner/manager (and friend) Suk Chu Kim! Thanks for all of your help through the years. I have yet another request for assistance with my 46 gallon reef tank. It is mainly a softie tank that has been doing very well, up and running for five years with a hang on back CPR skimmer. About six months ago, I switched from a hang on back filter to a canister filter in order to run charcoal. The skimmer has functioned very well, but is producing less since changing out the filter. I did a water change three days ago, cleaned the skimmer, changed the charcoal packs and since cannot get the skimmer to produce any bubbles in the first chamber. 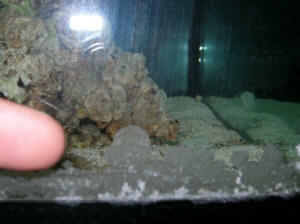 There is, however, a large amount of bubbles exiting into the tank. I have done every adjustment I can think of. There is no Venturi effect happening at all. Any ideas would be greatly appreciated! I have been very happy with this skimmer and I am out of ideas. The airline, where it attaches to the pump, was clogged with salt. I remove it, used a clean sewing needle to unblock it, rinsed and reattached. Working again, like new. Thanks again. You saved me the purchase of a new skimmer. It is soooo hard to keep explaining the cost of maintaining this tank to my husband! I have Bak Pak protein skimmers on my two tanks. One is a 55 gallon with 4 H. erectus seahorses, and the other is a 29 with a Banggai Cardinal, Neon Goby, Tail Spot Blenny, Chalk Bass, and Yellow Banded Possum Wrasse. The Cardinal is the largest fish; the bass and wrasse are both under one inch in length, and the Blenny is not much bigger. Neither Bak Pak skimmer produces much skimmate. No matter how I adjust the collection cup, at most I get froth that produces liquid in the cup that's only slightly discolored. Much of the time the foam doesn't rise high enough to spill over into the cup; sometimes, rather unexpectedly, it will start to foam up and collect liquid. I hear about running skimmers "dry" or "wet" and I don't even know what "dry" means, since all I usually get is a sort of film on the surfaces in the cup. I've read on WWM that the Bak Pak is an "okay" skimmer, but the AquaC may be better. I'm wondering if it makes sense to replace my skimmers with a different model, or if this is the most any skimmer will do in my tanks. I have a problem with hair algae in the 29, and I get Cyano in the 55; the nitrates are about 20 ppm in both tanks. I use Poly Filter pads in Aqua Clear power filters in each tank, which undoubtedly do some of the job of removing organics. I'm wondering, given that when the skimmers are producing foam, it's mostly clear, does this mean my water just doesn't have much gunk in it, so no skimmer would produce the smelly "skimmate" I keep hearing about? <Is possible but your nitrate level indicates something is amiss here especially with the light animal load you have. don't want to buy new skimmers if it won't make much difference. Thank you so much for your ongoing support. You're a true blessing to the hobby! Just a quick question today. My 54 gallon reef tank has been recovering very well after moving. However my CPR Bak-Pak skimmer has stopped skimming. I've contacted CPR and they helped reveal that the 30 lbs of oolitic sand that I added effected the performance of the unit. The problem however has not been resolved. The skimmer is pumping water like it should via the Rio rejuvenating pump (purchased brand new two weeks ago to see if this would solve the problem- it did not). The skimmer produced the correct amount of micro-bubbles but a large portion of them are pumped into the tank and nothing skims. I've had this unit for 3 years and have not experienced this problem. CPR support hypothesized that the 2 part putty I use may affect performance (I already knew this) as well as the sand. They also recommended a large water change which I performed (30%). The unit has been performing in this manor <manner> every since the sand was added (about 2 months ago). I have cleaned it several times to know avail. repeatedly and doing a large water change. I don't think that replacing the skimmer is the solution. <With one fish and a nitrate reading of 0, I would not expect too much skimmate but it should produce some foam. I'm betting you will find some type of build up in the air inlet. A small drill bit works quite well for cleaning this out. Calcium build-up in the venturi was one of my guesses too. I cleaned the old Rio pump several times, including using miniature brushes soaked in vinegar. I'm currently using a 2 week old, brand new pump so I'm pretty sure that this is not the issue. Thanks for the drill bit idea! If I do end of replacing the skimmer, do you think that this may solve the problem? I can't see an valid reasons for why the skimmer, old as it may be, would cease to stop producing foam. Tons of micro-bubbles are being producing in the chamber but it seems that something is preventing them from creating a cohesive foam. <Have you been using a new additive or food (liquid or dry) around the time the problem started. Some additives, foods, etc, and new plastics will/can cause a breakdown of surface tension due to oils, which will not allow the skimmer to produce waste. 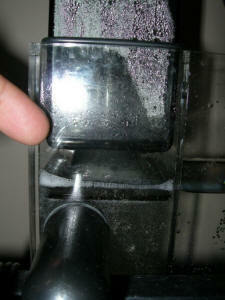 Back pressure will also cause this problem, can your collection cup breathe/release the air the skimmer is producing? Do you have another tank set up that you could try the skimmer in? 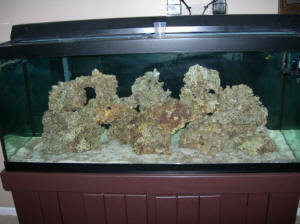 I have quite a few LPS corals and I'm quite generous with feeding them (although not so as to create algae problems). I know that the nutrients are in there. After several days of feeling satisfied with the current status of my system (a first), and finding no real "issues" that require immediate attention (or, as my wife calls it, an excuse to go out and by more stuff at the LFS), I'm grateful to finally have a quick inquiry to bring to the table. and rests inside of the lid on a closed top system. By simply getting a longer airline and running it outside of the lid, wouldn't I likely be providing a better source of oxygenated air and consequently raise my pH a bit? It's not terribly low at 8.0, but I'd like to see it stabilize at around 8.2 (just in case, my dKH is pretty stable at 10 on the German scale, Calcium ranges from about 400-420ppm). Thanks again for the wealth of information, and giving me something to read during my idle time at work!